If you ask us, there's nothing better than when the weather is warm enough to merit a swimsuit, a glass of frozé, and an afternoon spent under the sun and in the water at Pinewood. And we've had a great summer doing just that! But now that Fall is officially here and the weather slowly but surely dipping into cooler temperatures and the days are getting shorter and shorter, our patio too is readying itself for the chill of fall and winter. Before we drain the pools and pull out our fall sweaters though, we're throwing one last pool party to celebrate a great summer spent on the patio! 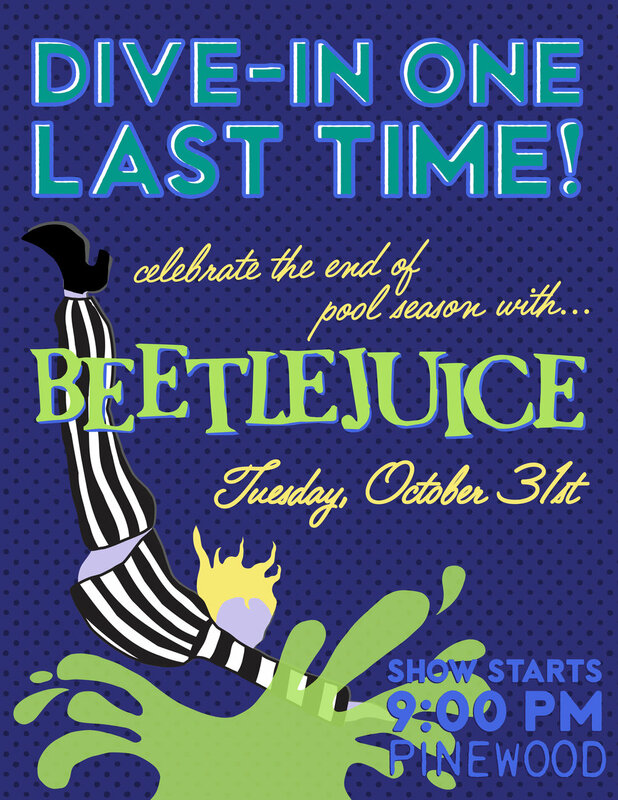 Join us for our fifth and final Dive-In Movie of the season at Pinewood on Tuesday, October 31st for a fun and spooky showing of Tim Burton's Beetlejuice! Because once the trick-or-treaters have come and gone, it's your turn to have a little bit of fun! The Show starts at 9:00, but feel free to get there early to grab your spot and maybe a snack or two. Chairs and blankets are always welcome and if you're brave enough to take a final dip in the pool, we'd love nothing more! Let's raise a glass to bidding summer a fond farewell! Dive In Movies This Summer at Pinewood!